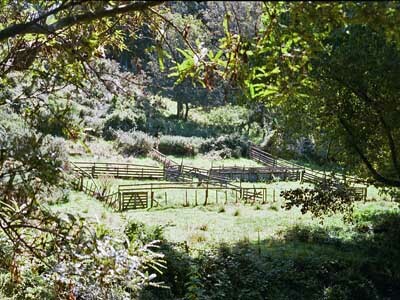 Location: On the rural block of land known as Waitakaro, on the corner of Glenside Road and Stebbings Road. A memorial has been constructed near where a pioneer woman was buried. The woman and her burial site is first mentioned in a letter written by Mrs Susannah Wall in 1842 and held in Alexander Turnbull library. Mrs Wall wrote to her family and told them that she went with Bishop Selwyn at four o'clock in the afternoon to visit the burial site of a neighbouring woman who had died the previous winter. The woman's husband was present also. The diary of Bishop Selwyn says he walked northwards from Wellington on 10 October 1842, departing at three o'clock and bedded down that night beside the Porirua stream, at six o'clock. The burial site was known by the residents of the local community and visited by them up until the 1950's-1960's. The land was bought by the Pender family at about this time. Mr Ronald Pender forwarded the location of the burial site to Wellington City Council with the intention of the site being listed for protection. It was not listed or protected. The gravesite was at risk of being destroyed in the development of the Westchester Drive extension, a road linking Churton Park and Glenside. The Glenside Progressive Assn. Inc. asked that the site be located before road construction proceeded. In a Court settlement, the Wellington City Council was required to ensure that the road construction did not disturb the site, and to build a memorial (regardless of whether the burial site was found). The road construction did not disturb the burial site and the memorial was constructed. The gravesite is believed to be located top right of the stockyards. These stockyards were removed for a road to be built however the burial site was not on the route of the road and is possibly higher up the hill in among the trees. “The gravesite, if it can be located, meets the definition of an archaeological site and would therefore be protected under the Historic Places Act 1992. You note that Wellington City Council has proposed the Westchester Drive link road which will pass close to this grave site. We suggest that Council would need to contact NZ Historic Places Trust to assess the need for an archaeological assessment and subsequently potential for an authority to work close to this grave site and to ensure that there are no other recorded or potential archaeological sites. Further details about the site, searching for the location and erection of a memorial are located here.